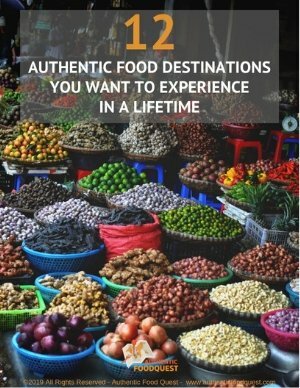 It’s no secret, travelers crave authentic experiences. 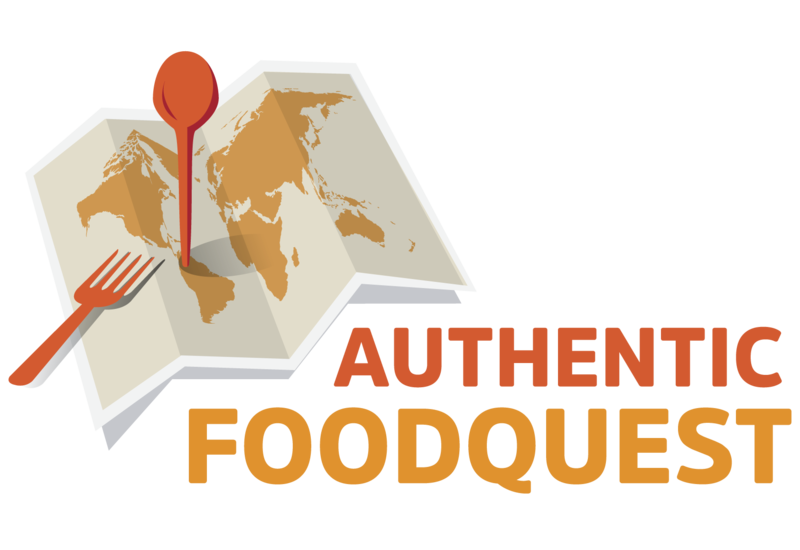 And, authentic food experiences is one way to understand a place from a local’s perspective. But finding those off-the-beaten-path experiences is not always easy. Visit.org, a partner we now work with, reached out to collaborate on our shared vision. 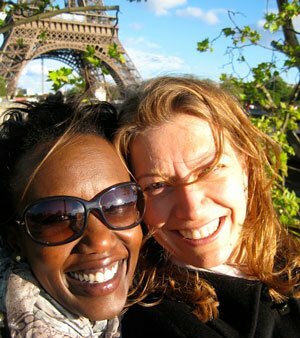 Visit.org offers immersive and impactful travel experiences with do-good organizations worldwide. Travelers can book an authentic experience and 100% of the hosts’ revenue is invested back into the local communities. 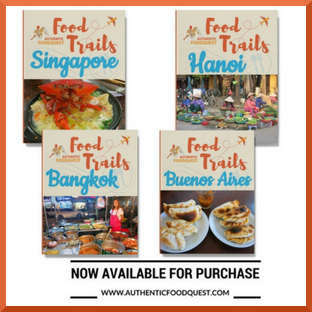 At Authentic Food Quest, we are on a mission to help people explore the local flavors on their travels. Together, we share similar values around authentic and immersive travel experiences. 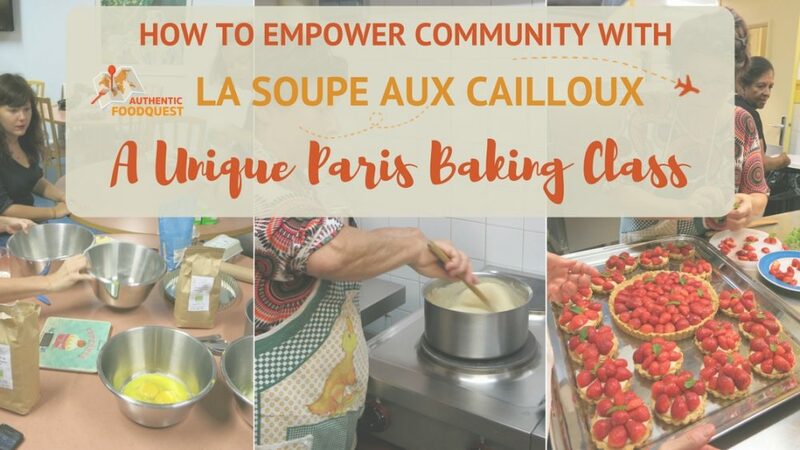 On a trip to France, we teamed up for a Paris baking class, with the non-profit organization, La Soupe Aux Cailloux. This unique experience focuses on healthy eating and sustainability, as tools for learning and sharing community through food. 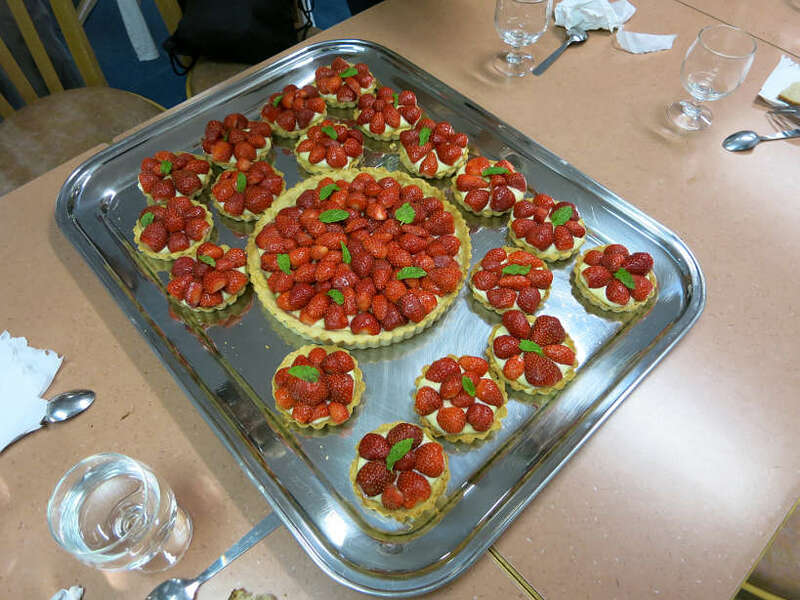 Read on for more about La Soupe Aux Cailloux and strawberry pie, the “French way” in a unique baking class. What is La Soupe Aux Cailloux? 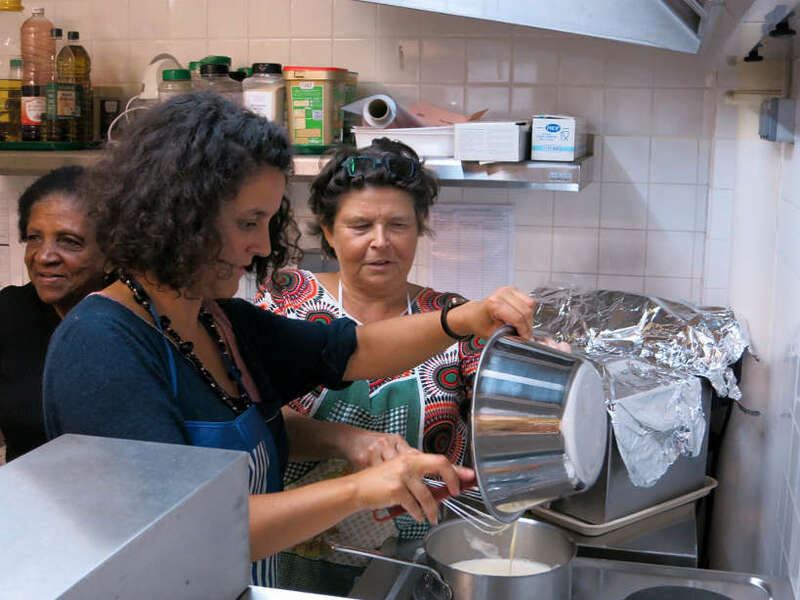 How Does La Soupe Aux Cailloux Bring the French Local Community Together? 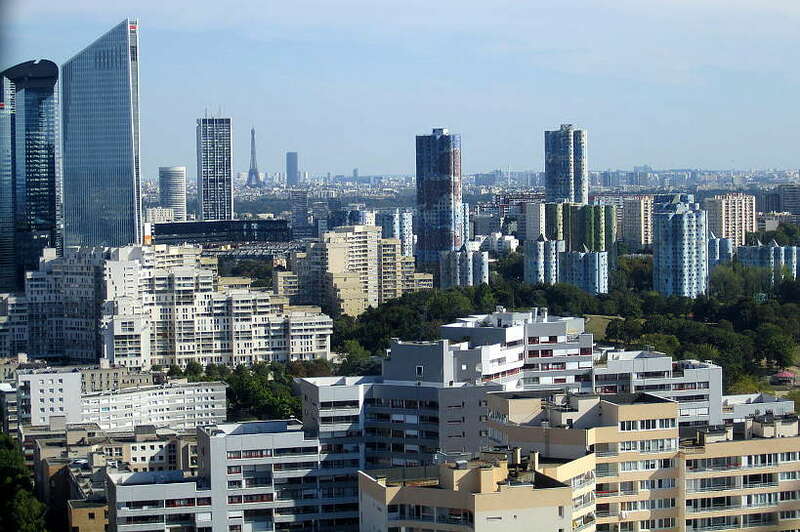 The organization is based in the west suburbs of Paris, in the city of Nanterre. Funny enough Nanterre is the city where I was born. Talk about a come back to one’s roots! 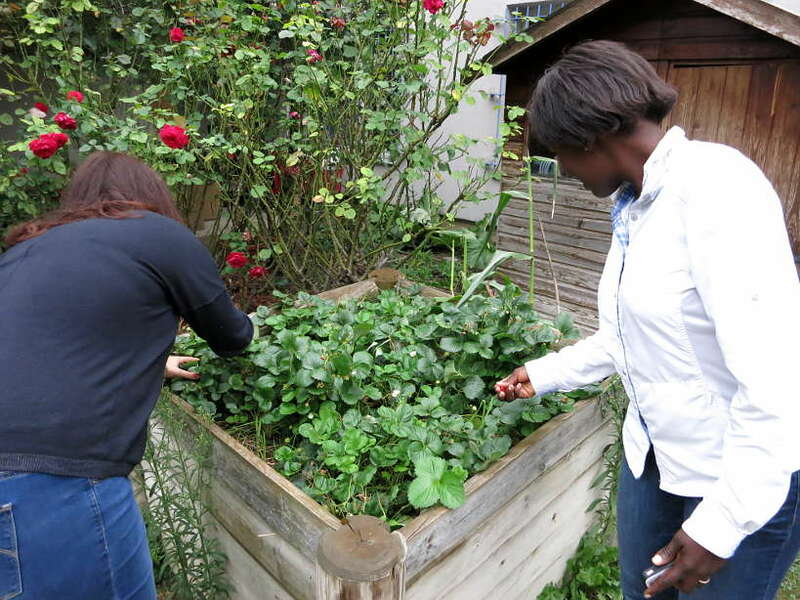 Established about six years ago, La Soupe Aux Cailloux is a non-profit organization, which works closely with the support of the Nanterre City Hall. Their goal is to bring together the local community and teaching about food and healthy cooking with seasonal, local products, and where possible organic. The name of the organization has an interesting story. It is actually both a fable and a cooking technique. The organization got its name from the fable about “La Soupe Aux Cailloux”. The story is about an old lady who teaches the secret of happiness. The lady goes to a foreign village to ask for food and shelter. But unfortunately, no one responds to her requests. She decides to make a soup from stones. Intrigued, a young boy comes to check what she is making. And the old lady is wondering if she could get a bigger pan. The boy goes to talk to his mother to get a bigger pan. The mother intrigued by the soup comes check what the old lady is making. Then the old lady mentioned that with some carrots it would be better. The mother brings her some. People from the village, curious, start coming out. And each time someone comes, a new vegetable is brought to the soup. Everyone from the community brings something to eat and the villagers end up sharing the soup happily together. As you might have guessed, the fable is about sharing and bringing the community together. Actually, La Soupe Aux Cailloux is also a traditional way of making soup. It comes from the eastern part of France. While cooking, a stone is put into the soup and is used to mix the vegetables together while all the ingredients are simmering. During the cooking process, the stone keeps agitating the soup and makes for a smooth texture in the end. 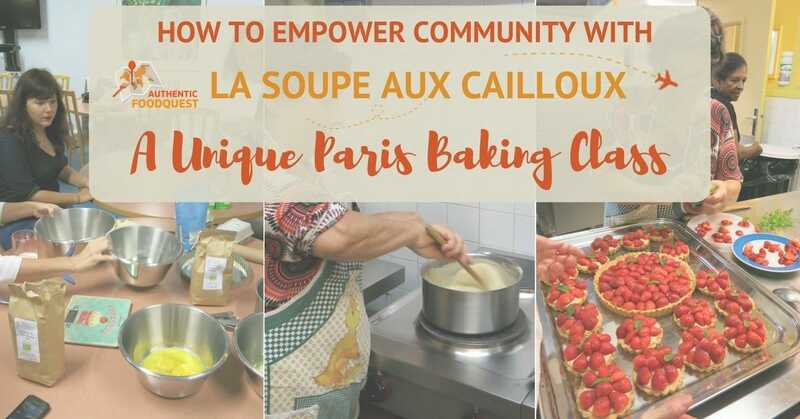 La Soupe Aux Cailloux offers three different activities to the local community. First, there is a children’s workshop where children cook and learn about grains and vegetables they don’t usually eat. Secondly, they have a “tables d’hotes”. Two to three times a month, they propose a menu that people from the community prepare, cook and eat together. The food is sourced locally at the markets (vegetables), the organic stores (dairy) and through the local producers (dry products: oil, grains, pasta/rice, etc). Thirdly, the organization runs a deli store where they sell organic products. The items are mostly dry products like oils, condiments and dry goods. Picking fresh strawberries in the community garden, Not enough for the pie though! Overall the organization emphasizes more a more vegetarian menu and encourages eating less meat and fish for economic and sustainability reasons. New from La Soupe Aux Cailloux, is a fourth activity for visitors. This new baking workshop is offered in partnership with Visit.org. The new activity is a cooking class to learn to make French pastries. The profit from this workshop is invested into developing cooking workshops and programs so that more locals can benefit from a balanced and healthy diet. We had the chance to participate in a workshop with the community. With about 10 locals from Nanterre, we prepared the different dishes based on the menu planned by the chef at the organization. 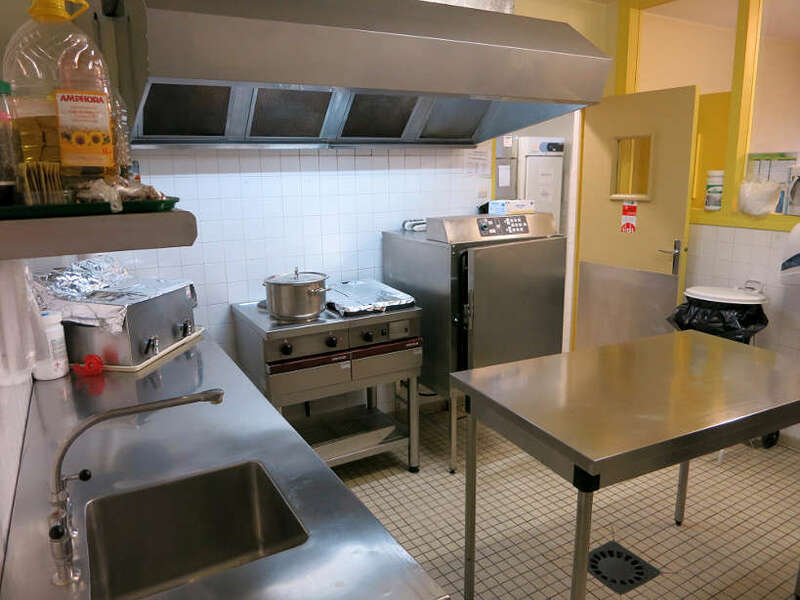 The organization uses a commercial kitchen provided by the City Hall. Everyone from the organization has access to the kitchen and can participate in cooking and preparing food. We really enjoyed mingling with the local community. It was eye-opening hearing the locals passion for healthy eating and responsibility for the planet and future generations. Although we made a full meal, our main experience was around the desserts. We learned how to make a scrumptious strawberry pie the French way. How to make such a delightful strawberry pie? The “crème pâtissière” is the filling used in the strawberry pie. This is a rich creamy custard that is used in many French desserts. It’s what gives it a smooth taste. This recipe on how to make a “crème pâtissière” is simple and precise enough to follow. The key lies in letting the preparation thicken enough without burning it. Besides the “crème pâtissière” all you need is a pastry shell that you fill with the “crème pâtissière” before layering the fresh strawberries. Cook the pastry shell separately for about 20 to 25 min at 350F. In the meantime, slice the strawberries and prepare the crème pâtissière. 6- Remove from the heat cover with cling wrap to prevent a skin forming. Allow to cool and place in the fridge until needed. Once the pastry shell is baked, fill the bottom by spreading the crème pâtissière for a thickness of 1cm or about ⅓ inch. Then place the slices of strawberries on top the crème pâtissière. Add the fresh mint on top of the strawberries. And it is ready! Taking this Paris baking class at La Soupe Aux Cailloux , was a fun and enjoyable food activity. 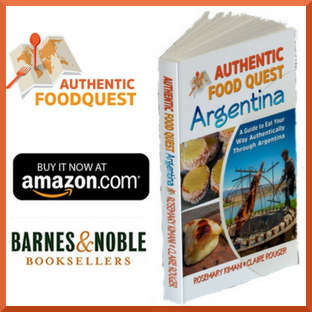 It was a very local experience and the cuisine was accessible by all – no chefs, just people passionate by food coming together with the community. Living up to their origin story, everyone came together. Locals genuinely had a great time connecting. Recipes were shared and the atmosphere very convivial. One of things that was very surprising was to note the level of concern about the food in France. For many in the U.S., the food in France is exceptional and the products of high quality. To hear the level of passion around the local and organic products was unexpected. 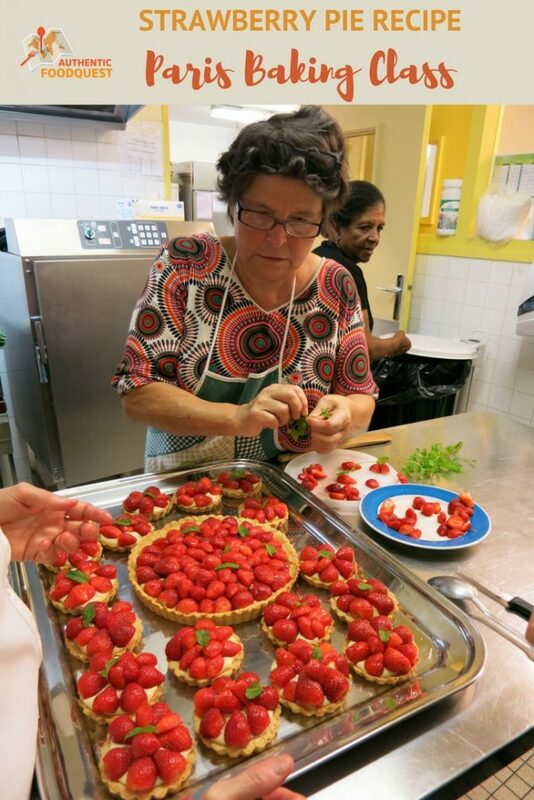 Learning how to make the strawberry pie and the delicious crème pâtissière was the highlight of the experience. Not from chefs, but from ladies in the neighborhood, each with their own techniques. Learn from the locals, while helping build and support the community! Have you ever taken a baking class on your travels? What pastry or dessert did you learn to make? Select France in the drop down menu. Then use the filters to select foodies activities. 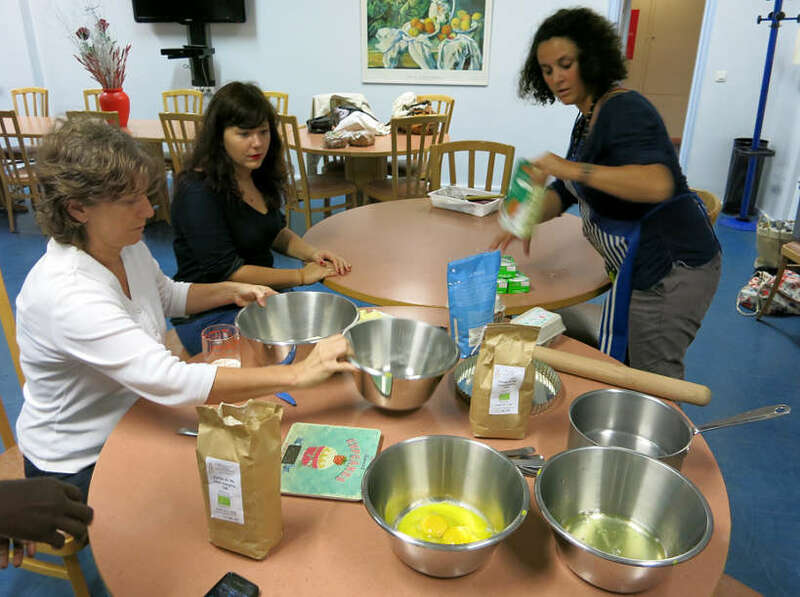 It will direct your to all the foodies activities in Paris including the Paris baking class with La Soupe Aux Cailloux. Address: 27 rue sadi carnot, Nanterre, Hauts-de-Seine, France. Take the RER A in the direction of St. Germain en Laye to the Nanterre Ville stop. Then, take bus 160 to the Les Verets stop. Tour infos: 2 hours – Monday through Friday from 10am to 6pm by appointment. Cost: $46 USD per person or $39 USD if at least two people join the class. To learn more about the secrets of French baking, see the simple recipes in this book! Hi Ryan, thanks for sharing your blogging foundation. Indeed, sharing, caring and coming together is the recipe for success in any industry. Definitively time to get to Paris. Let’s connect and make the “stone soup” there 🙂 Thanks for stopping by!! Baking classes are so cool, I just wish I had more time to do them. To do this in other countries as well and learning from the locals must be an amazing experience (one I havent tried). Strawberry pie however, hmmmm…..sounds yummy but I dont think I could eat all of it. You can’t go wrong with strawberry pie, especially when everything is fresh and local. You’re right taking baking classes is a great way to experience the sweets of a country. Make time on your next trip and let us know what you end up making. Thanks Danik. I love the mission of Visit.org ,we all crave that deeper experience and I want to ensure my money goes into the local community. I especially love cooking classes, that strawberry pie looks divine. We are on the same page about creating deeper experiences when traveling. This is why we teamed up with Visit.org. Connecting with the locals at the cooking class was a great experience, not to mention learning how to make strawberry pie the “French” way. Stop by the next time you are in Paris and be prepared to be delighted! There seems to be a trope going around about travelers returning home. The strawberry pie looks amazing. We live in San Diego and, just up the road in Carlsbad and all along the So Cal coast, they grow super yummy strawberries. I’ll remember this post next time I see a “flat price” that I just can’t pass up. Lucky you…make sure to grab that flat of fresh strawberries and invite the neighbors. Build community with the power of food…or in this strawberries 🙂 Thanks for stopping by! I would really enjoy this baking class what better place to learn how to bake than in Paris. I think the strawberry pie looks delicious not sure mine would turn out as good as this though as I am not a very good baker. The great thing about taking the class Jenni is that you will have the guidance of “local experts” and your pie will turn out divine! Do indeed check out class the next time you are in Paris. Thanks for stopping by. I love the fable, and totally agree that food can bring together a community. 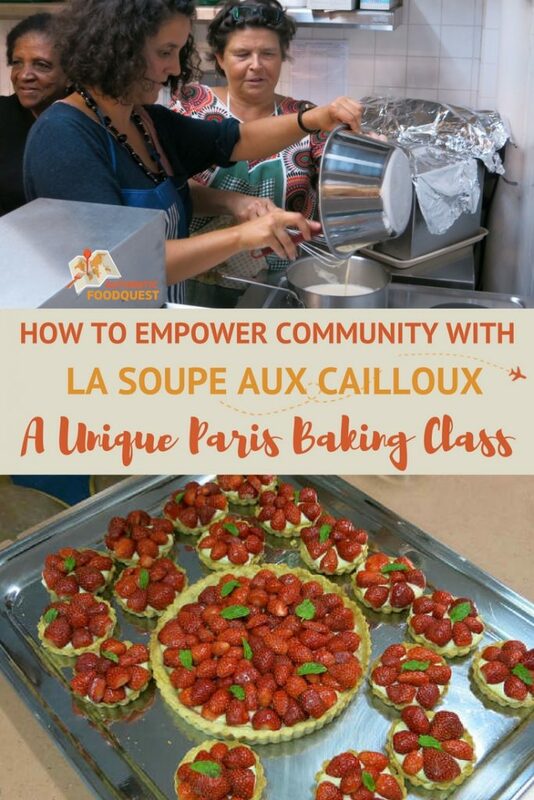 I love the mission of La Soupe Aux Cailloux to promote healthy eating throughout the community and educate – and it’s great that they can offer such a cool local experience with the profits going to the cause. Strawberry pie is my FAVORITE :D! You are so right Meg, can’t go wrong with strawberry pie…especially fresh and with a French touch. We agree and like to bring awareness and support local organizations that are promoting healthy eating! The next time your travel take you to Paris, take a baking class, you will be delighted! Awesome!! Great to hear that. Please do come back and tell us all about your experience! Looking forward to it….thanks Sherianne! I love that more travelers and tour companies are focusing on experiential travel! So much better than going to a place for the t-shirt! You are so right, travel today os all about having a deeper and more local experience. Skip the “things” and go for the experience. Cheers! What a fantastic experience at La Soupe Aux Cailloux, and those strawberries tarts looks incredible. Food for me is always about bringing people together, the problem is we all get so busy that we tend to eat and run without taking the time to cook, take a moment and enjoy. We agree Sara, food is about bringing the community together. Being a part of the local French community with La Soupe Aux Cailloux was a very special moment. We need to remember to connect with our loved ones…and food is the perfect vehicle to do that. Thanks so much. I’m familiar with that fable about building community, it still holds very true today, doesn’t it? We should all do it more often. Now back to the food – that pie looks delicious! A good crème pâtissière is so key to a tasty fruit pie. You’ve inspired me to try my hand at your recipe. 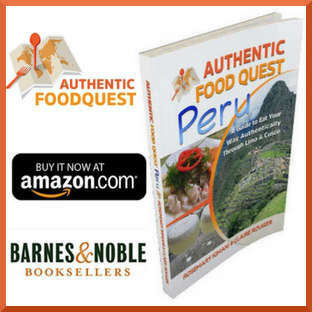 Traveling through food does give us a rich introduction to the local culture. The community experience at Soupe Aux Cailloux was amazing. Highly recommend it to travelers.